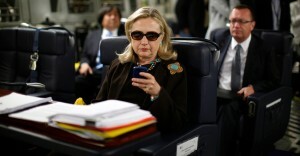 Two emails that traversed Clinton’s personal system contained information that had been designated “top secret” and “Sensitive Compartmented Information,” one of the government’s highest classification ratings, U.S. officials said. Federal investigators have begun looking into the security of Clinton’s email setup after the inspector general of the U.S. intelligence agencies said that classified information may have passed through the system. There is no evidence she used encryption to prevent prying eyes from accessing the emails or her personal server.